Coke Lockout Brampton. Still going. « You know… that Blog? In the face of such a colossal battle, it is hard to keep spirits up and pretend life is hunky-dory. 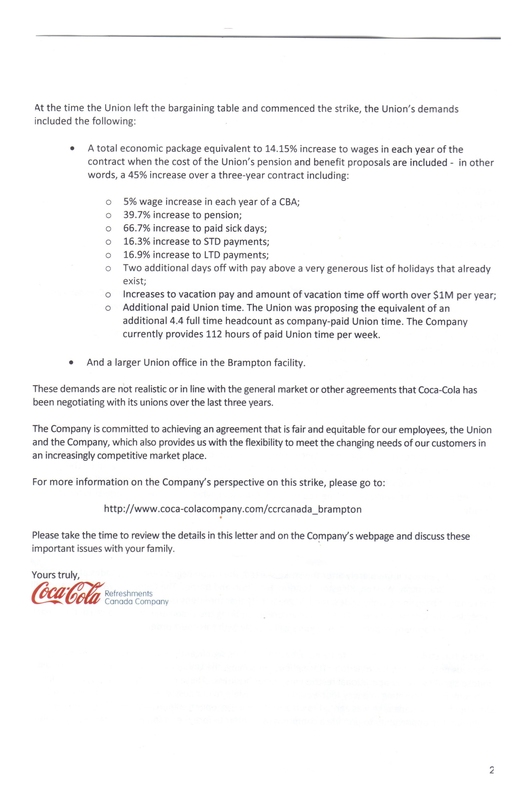 Coca Cola locked out its workers on June 26th, hours before the strike deadline. That’s 2 weeks ago tomorrow. Since then they have done nothing but ignore the Union requesting they return to the negotiating table, and post complete fabrications of why they did it. Finally, today, they have agreed to resume talks. A good step, but we’re nowhere near an agreement. 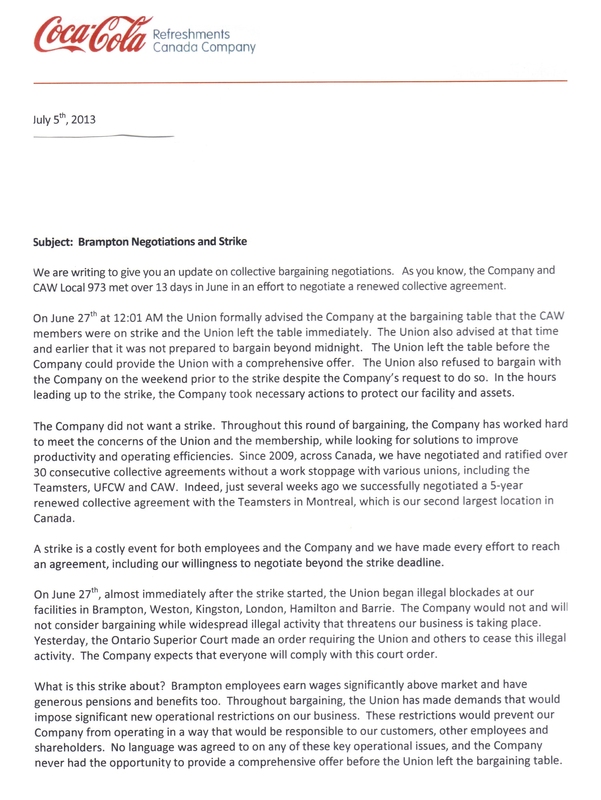 They even sent a letter to the employees outlining the demands they say the Union made, and expecting the very employees they’ve locked out to believe it! The level of audacity here is off the charts! Want a laugh? Here’s Page 1 and Page 2. You might notice that they don’t provide a way for their employees to actually call and speak to someone. Or even email them. They’ve completely stripped their letterhead of contact info. No sane person would ever ask for what the company claims the union is asking for, when we all agree the current wages and benefits are fair. The guys get statutory holidays – they’re not asking for more. They get a reasonable amount of sick days, and don’t need more of those either. The only thing our people are truly concerned about is improving the safety of the workers in the Brampton plant, keeping pension and benefits generally as they are – including those for new hires (Coke doesn’t want more Full-timers, and they don’t want anyone new to get any pension) – and ensuring there will still be jobs to come back to, instead of Coke outsourcing those jobs. There are no doubt other adjustments that I’m not privvy to; I’m neither a union member or Coke worker. I can say with confidence though, that the union is neither greedy, nor stupid. I worry about finances, first and foremost, since that income is lost, and there’s a mortgage and other bills to pay. Hard on what we’re bringing in right now. We’ll be ok, because I am my father’s daughter and had rainy-day funds put away “just in case”. What I can do to stretch a dollar is pretty impressive, if I do say so myself. Some summer plans have been postponed or canceled, in large part because walking the picket line is so important. Our youngest daughter doesn’t seem to be noticing that too much though; she’s quite happy spending her days with the neighbourhood kids. Our oldest daughter is working full time, getting ready for College in the fall. This doesn’t impact her nearly so much. I worry about my husband, because the stress is pretty huge. He’s gone every day, walking the picket line and trying to make a difference. He’s there longer than he’s scheduled to be, doing more than he’s been asked to do. That’s the kind of guy he is, but he’s not the only one. This is pretty typical of the kind of people who work at the Brampton Coke plant. We have good people behind us. Community support, and also there are other websites springing into action, and also into existence. The amount of people Tweeting and Re-tweeting has exploded in support of #cokestrike. So no, Coke. The general public really isn’t naive, nor are they stupid. What they are is tired of mega corporations trying to crush unions, and erode the middle class. My own posts here have slowed down a little, because I’m so active on Twitter these days, and because there are better websites for this sort of post. This is a personal blog, and eventually it will return to normalcy. I’m not stopping yet though – this is as much my fight as it is my husbands, and there are thousands of people affected by Coke’s actions and behaviour in Canada. 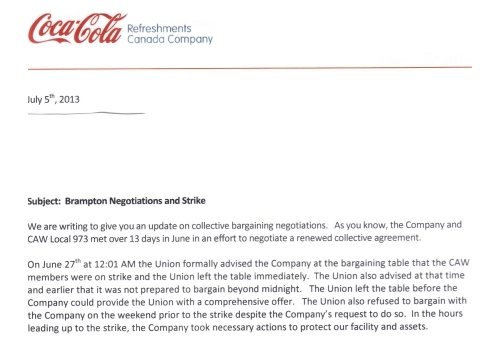 Once they’re through with this negotiation at the largest Coca Cola plant in Canada, it will be on to the next Coca Cola location whose contract is set to expire. And the next. And the next. We’re fighting for employees and families across the country. Jenn I hope that you are safe and not taking any chances. I read that killercoke.org site and it has me really spooked at what coke is capable of. I don’t drink soda anymore because its so unhealthy but because of what I’m seeing here and on twitter I’ll be talking to people to tell them not to buy coke products anymore. They’re an evil company. Please stay safe!!!!!!!!!!!!!!! Thank you Reggie but I am sure Coke isn’t going to do anything stupid where I’m concerned. They probably know who I am by now, but there are also a lot of other people who know who I am and the battle we’re fighting here. If something happened to me or my husband it would be all too clear where to point fingers. There are also a lot of other people talking about Coke and their behaviour of late. I’m just one of many, many people. Hubby got his letter in the mail today. I immediately noticed the lack of contact info because my immediate reaction was to want to send a note or an email. But I quickly realized this was all old news/ old lies, all ones we’ve already heard. It’s hard to know whether to lash out like a rabid dog or just take the high road. But really? They can’t spell Mississauga? Maybe, I’m a bit fanatical about spelling but really? I’m so sorry to hear about all of this. No one should have such worries these days; I hope the corporate suits come to their senses soon for all of you. Dear “Frustrated ex-employee – Concerned@rogers.com” at IP address 204.237.94.107 and 99.225.173.111 (both on the Rogers network) I got your comments, and you’re right; I selected them for the trash, where they belong. Your verbal diarrhea was directed at people that didn’t deserve it. Your opinion of me is irrelevant. Also, your email is likely made up… unless you really are R. DiFilippo? And if you are, I do wonder why you didn’t have the guts to put your name where your mouth is? Go figure. I don’t post bogus comments on my blog. I’m not going to allow your nonsense on my blog simply for your childish gratification. How about YOU get a life instead?